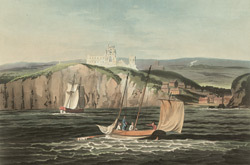 View of Whitby Abbey in Yorkshire by Edward Dayes. The Abbey is situated on a cliff above the village of Whitby. It was founded in the year 657 by St Hilda (known as Hild in her lifetime) and became an important centre for Christians in the North of England. In 664 the Synod of Whitby was held here- this was an important meeting about the dating of Easter which was held between the Celtic and Roman branches of the Christian church. The Abbey was actually destroyed by invading Vikings in the 9th century but in the 11th century it was rebuilt as a Benedictine monastery and became a place of pilgrimage. The Abbey was dissolved in 1538 and passed to the Cholmley family who built a mansion house from the bricks.